Robot rockers Daft Punk are delivering their live show to home stereos with a new live album "Alive 2007" but don't expect a behind the scenes peek at their LED-tastic show, which features a 20-foot-high glowing pyramid [spaceship], as the release will come with no live video footage. "That's the way we want to leave it right now," Thomas Bangalter told Billboard magazine. The album will instead be released as a 27-track single CD or 32-track double CD [including encore versions] with a fifty-page booklet. A live version of 'Harder, Better, Faster, Stronger' will be the lead single from the album accompanied by a music video directed by Olivier Gondry, that includes live footage shot by fans who were asked to bring their cameras to select shows and submit the footage. 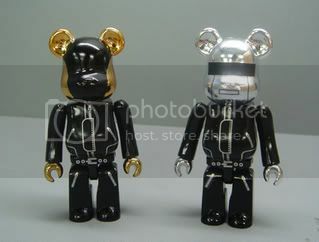 FIGURES... Once again Medicom and Daftpunk get collaborate on a wikked Bearbrick Set in conjunction with the release. 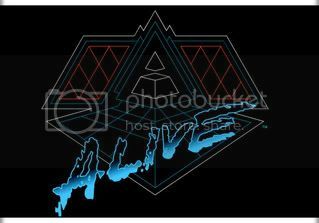 This time, in order to get your hands onto the set, you have to purchase the Japanese version of Daft Punk "Alive 2007". The release date for the double disc is scheduled for the 19th of November and the dollar conversion for the 5000 yen price equals around 45 American dollars. Considering that the previous bricks the Dafters designed are now worth 300 or so on e-Bay, I'd say that it is a bargain as the music alone is worth more than that. Those who experienced their live set, know that is the god's truth. The set is limited to 3000 lucky fuckers, worldwide. You Want Fries With That?? ?